There’s a huge SEO change happening right now, and your site is in the thick of it, like it or not. Updates in WordPress, HTML5, and Genesis give you access to something that only enterprise-level companies had the bucks to do. Now it’s your turn to reap the rewards. I’ll help you understand it all in ways that are easy to grasp. When you finish this post, you’ll be talking like a pro about the hottest buzzwords in SEO. And, you’ll know what you can, and should, do and why. Before we get into this, here’s help with the lingo. It’s a lot easier to understand when you know what everybody’s talking about. HTML stands for HyperText Markup Language. It is a set of tags that tells browsers how to display the content on your website. Version 5 has been in development since 2011. But most browsers only fully support HTML4 and a little of HTML5. That may change rapidly now that HTML5 is being supported in the core of WordPress. Schema.org and semantic markup are much the same thing. Schema.org is the standardized list of what you can use. Semantic markup is the practice of using it. You will hear them used interchangeably in most every SEO post from now on. 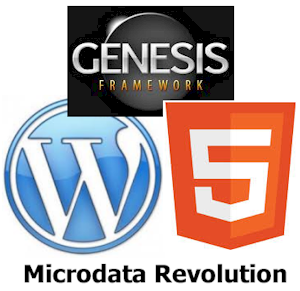 Of its many features, HTML5 includes a new semantic markup syntax called microdata. You will hear this term used interchangeably for schema and semantic markup from now on too. I bet you only took notice of two or three results. You probably skipped right over the one without any special markup in that list. Did you notice that I had two posts in this list? Even so, betting you were more drawn to click either mine or the one from my collegue, Regina Smola at WPSecurityLock. And, yes, authorship is working properly. Only one picture of you per page, no matter how many posts you have there. to have your content found and clicked on Google. Remember, your content is sitting on a page with everything else Google chooses to display for that keyword or phrase. 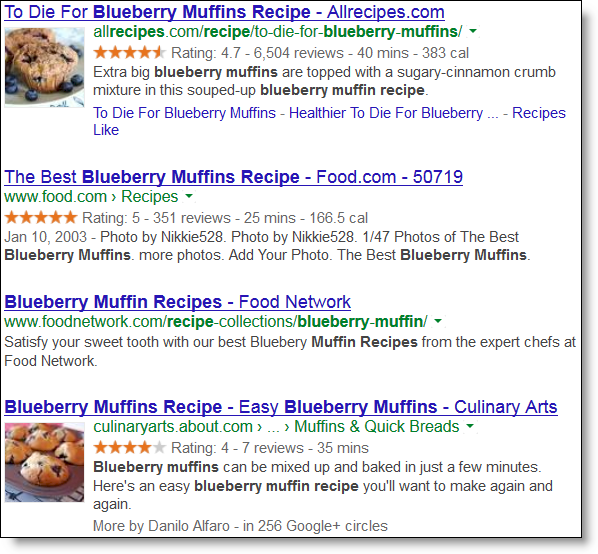 Search engine results with rich data, such as images and reviews get more clicks. If you don’t have them, your posts get lost on the page between those that do. Microdata is what makes all this happen. Interested yet? There’s more brownie points to it than that. Stay with me here. And don’t freak out. Go have a look at a sample for Avatar on the Schema.org site. Yes, it is. And that’s why this type of special markup has been around a long time but only the big guns could afford to use it. They shelled out real money to a pro SEO to get it done. With the recent updates to WordPress, you can now have at least the basics available to you now, without paying big money. New themes will include basic microdata. Themes supply the microdata tags. However, only a few of the child themes have been updated to take advantage of it. HTML5 and microdata, that doesn’t mean your theme provides the tags. And, even if your theme does support it, that will still likely only be at a very base level. But even that changes a lot with regard to return on SEO investment. The most basic schema markup tells Google that it is indexing either a post on your blog or a web page. That may not sound like much but it’s huge. A post on your blog will carry the additional schema markup of “article” and that will qualify it to be considered for Google’s new in-depth article perk. It will need some extra help to get on that short list. More on that in a moment. And, markup is available for web pages too, like your About and Contact page. This is a big help to Google. Microdata is also available for you as the author. That one is going to help you with authorship. Other biggies include microdata for your site’s header, footer, navigation, and sidebar. For a full list of the default markup in Genesis 2.0, see this super post by Brad Dalton on WPSites. It also includes the Hangout video from a Genesis Roundtable that aired before 2.0 came out and nearly set me on fire about how microdata will change everything in SEO. The fact is, you will never use all of that. And no theme will ever natively support it all. You will want to use a fraction of the microdata and tailor it to fit your site. As I’ve been saying for months, we are going to see a real boom in new niche site themes on the market. They will boast specific schema markup that is tailored to that topic. We already have niche themes for real estate and recipes. They will probably be among the first to take advantage of highly targeted microdata output by integrating it into the theme. Photography sites are another good candidate. As are sites for reviews. And of course, music listings. Kindly borrowed from Google Webmaster Tools. So, these niche themes will have the basic microdata output, and then some of the extra microdata tags for their specific content. In other words, we’re going to see specialized schema markup embedded in themes for certain niches. There is a short list running around about what microdata Google supports. Google indexes all microdata in the Schema.org list. content types with markup right now. You don’t have to wait for a new or niche theme to get microdata support. You can do it for yourself. In fact, you’ll probably have to. Genesis 2.0 gives you the basics. Getting a new child theme that supports it will still only give you the basics. that fits the type of content you produce. There are already several new tools and plugins to help you create your own schema. More are on the way. I’ll be reviewing them in-depth so you can see what’s involved. Look for those posts soon. And, I’ll be breaking them out into who can most benefit from each one. Is there something easy I can use? Depends, what do you need to accomplish and how far do you want to go with setting up microdata? I’m not trying to be vague here. To get beyond the basics, there is not a single microdata option available that’s completely hands-off, nor is there likely to be anytime in the next year, or ever. There has never been anything about SEO that is set it and forget it. Google changes too much for that. Even the super duper WordPress SEO plugin by Yoast, that’s been around for years, is not install-and-go either. You have to configure it properly for your site with your info. And you have to tweak it. Joost de Valk is always adding something to keep pace with Google’s changes. And on that note, remember when themes used to advertise they were SEO friendly, meaning they had built-in SEO support? 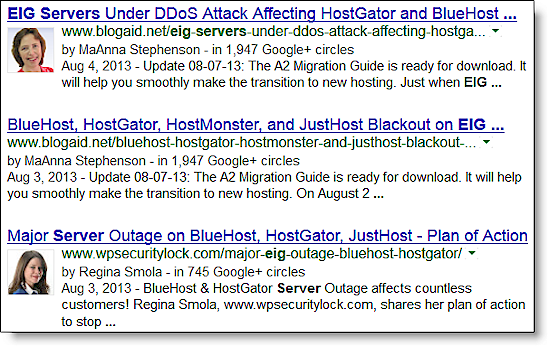 Nowadays, you want those built in options to bow out gracefully when you install an SEO plugin. That’s the same thing that should happen to themes with microdata support too. All that said, the very least you can do is to get a theme that outputs basic microdata. The new themes from StudioPress support it. More new themes are on the way, as are upgrades for existing themes. Or, if you have a fully customized theme that runs on Genesis (like I do on BlogAid), you can pay around $250 to have it updated. But, wait for my microdata plugin reviews before you do anything. Not kidding. Wait for them. I’ll be dividing them out into what’s good for what type of business, what’s easy to use, and what will take you as far as you want to go. And, they may obliterate having to update your theme at all because some of them will let you set up the basics too. Google has been indexing microdata for years. Ways for regular folks to include it in their sites is what’s new. The sky won’t fall if you have to wait a few days or weeks, or even months. But not a year. You’ll want to move on this before then. Before you listen to anybody’s advice, including mine, vet the source. Doesn’t matter how big or impressive they are. Doesn’t even matter what results they are getting. What matters is whether they are offering a solution that fits your site and business. You don’t listen to a movie reviewer who doesn’t have the same taste as you. Be careful of listening to folks who claim results in a business that is not like yours. If you’re a beginner or a pro, get the tool that fits what you do and where you are. Period. I hope this post has helped better prepare you for the SEO revolution. If you have a website, you’re involved. My goal is to help you make good decisions. To do that, you need to be well informed. If that decision is to do all this yourself, my plugin and tool reviews are on the way. If you want a private consultation, contact me. I’ll help you find a good fit for your site, including outsourcing options. In posts to come, I’ll give you ways to easily check your site’s markup and consider the type of schema that is a good fit for your content. MaAnna – Thanks for the excellent write up! I love the detail and depth of the article. I look forward to reading your thoughts on the microdata plugins. I will need to update my site to Genesis 2.0 soon! Darren, the first post on the easiest ways to get the biggest bang for your buck is coming out soon. Just finished all of the research for it. You’ll see exactly what upgrading to Genesis 2.0 gives you. Thanks so much for this series of posts! This helps so much as I\\\’m trying to learn how microdata fits with SEO. SEO is a top priority for my company. We need better rankings than some of our competitors in a very niche market. I believe microdata can help tremendously. I\\\’m trying to learn more about IE incompatibility and how to fix that in both the XHTML and HTML5, since 47% of our readers are using this browser. I finally got our newtheme the way we want it, now I feel like I\\\’ve fallen into a rabbit hole in regards to HTML5 and microdata. Your posts definitely help sort through this new digital maze. Thanks! Thanks so much for your kind words, Angela. I was really reaching out to my designer and SEO followers with these posts more than anyone. It really does feel like a whole other rabbit whole, doesn’t it? I’m in the same boat, and need to make affordable ways for my clients to jump on the microdata bandwagon. Wait til you see the new posts I have coming for plugins to customize on a per post/page basis! Ouch, 47% on IE?!? That’s terrible. Maybe you could consider writing a post on why they need to switch. With HTML5, they are really missing so much.